The game being tested in the photo was the firm’s next great card game. George invented it, with the help of wife Grace. It came about because standard playing cards, with their kings, queens, and jacks, were frowned upon in many parts of the country. The Puritans ethic denounced them as especially unfit for children. This was because playing cards had evolved from the tarot, whose cards were considered by many religions to be works of the devil. 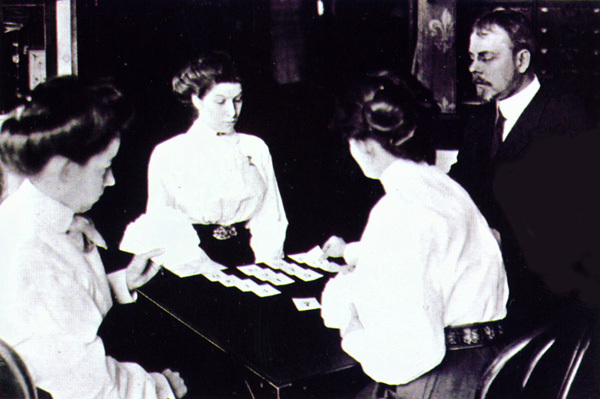 Religious consideration aside, many enjoyable games were played with cards, independent of their pictures—for example, whist, a very popular trick-tacking game (the ancestor of bridge). George saw an opportunity to capitalize on these play principles by publishing a game worthy of religious endorsement, rather than denouncement. To accomplish this, George and Grace recast the standard deck of playing cards, They replaced the Ace with a “1” and the jack, queen, and king with “11,” “12,” and “13” cards, and added a “14” card as well. The hearts, spades, clubs, and diamonds were replaced with “suits” of colors: red, yellow, green, and black. With this new fifty-six-card deck, whist and most other common card games could be faithfully played. The game now lacked only a title. Grace suggested naming it, for reasons unknown, Rook, after a type of crow. 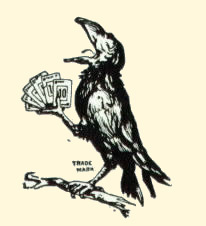 George commissioned an illustration that pictured a rook holding a fan of five cards in its right claw while perched on a branch. Husband and wife hosted parties to play Rook and decide on the ten games to include in its rules. “Most of these games are light, bright and spirited,” wrote George in the 1906 catalog. “One or two of them are very easy, simple games; others are equivalent to Hearts and Whist.” Rook also sold for fifty cents. Unlike Pit, which was an instant success, and Flinch, which had a following before Parker Brothers acquired it, sales of Rook were slow at first. Because Grace was such a believer in the merits of the game, George stuck with it doggedly, advertised it carefully, and gradually built it into a game whose life would outlast his own. The book is excellent! It's about the history of Parker Brothers and the man who gave it it's start. Philip Orbanes, the book's author, started working for Parker Brothers in 1979 as director of new products research. In time he became head of research and development and remained with Parker Brothers until 1990. He now works with Winning Moves (www.winning-moves.com), a company he co-founded due to his love for games.